But 25 percent of Ultra High Net Worth investors with a net worth between $5 million and $25 million have tested their financial advisor, according to the study. That includes 44 percent of UHNW investors under the age of 45 (Millennials and Gen X investors). Even 22 percent of World War II era investors have texted their advisor at some point. 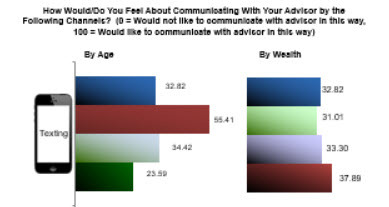 Asked if they would like to be able to text their financial advisor, placing their interest on a 0-to-100 scale, UHNW investors put their interest at 32.82, while the Millennials and Gen X investors placed it at 55.41.